Blessed with rich history, diversified culture, a tour to Vietnam and Myanmar offers an unbeaten experience in Southeast Asia. Following the cruise in magical Halong Bay, this 14 day trip offers a great chance to experience the vibrant life of Hanoi, bustling city of Yangon and ancient Bagan kingdom. The combination of these two beautiful countries is simply a trip of desire…Let’s come and join us for a memorable experience! Up on arrival to Tan Son Nhat inernational airport in HCM City, Our Guide and driver from Saigon Office will meet you at the airport and transfer you to your hotel in the central of the city. Welcome dinner in one of the finest restaurants in town. Enjoy the rest of the day free at your leisure. 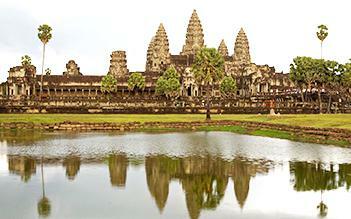 Today we travel to the Mekong River Delta on a day trip to explore the rich culture and lush fluvial landscape. 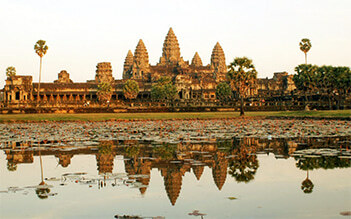 Our driver and guide will meet you at your hotel and take you to Cai Be. Start your tour with a visit to Cai Be’s colorful floating market, cruising among the local barges stuffed-full of fruits and vegetables. Visit some local workshops then enjoy a delicious lunch served at an ancient house (over 170 years old!) in the cool shade of An Binh Island’s orchards. In the afternoon, take a traditional rowboat and venture deeper into the countryside, floating through narrow canals to enjoy the peaceful surroundings. Stop at a nursery garden to discover how farmers along the delta produce their world famous fruits and vegetables. The cruise ends around 3.30 PM in Vinh Long. Our driver will meet you at the dock and take you back to Saigon. Enjoy a morning city tour visit visiting the central post office, Notre Dame Cathedral, Reunification Palace, BenThanh market. From the 16th to 18th centuries, Hoian was a thriving international commercial port for Chinese, Dutch, French, Japanese, and Portuguese and Arab traders. These people came primarily to trade in high grade silk, which is still produced in the area, as well as ceramics. Today, Hoian is a quaint riverside town, popular with tourists for its eclectic architecture, tailor shops, and numerous cafes. Some of the buildings in the narrow streets have remained unchanged for more than a century. We enjoy a half-day walking tour through the narrow winding streets of the Ancient Quarter, visiting Chua Ong Pagoda, Chinese Assembly Halls, the 200-year old Tan Ky ancestral house, and the Japanese Bridge. After lunch we take a short boat trip to a nearby island to visit a handicraft village specializing in ceramics, and also the boat building yards. Hoi An is now one of UNESCO's fifth World Heritage designated sites in Vietnam. Then, back to your hotel. Evening is free at leisure. 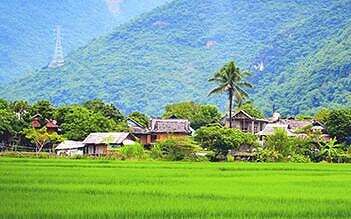 Meet the driver at the lobby of the hotel and leave Hoian in the morning, drive to Hue over the 500m high HaiVan pass with a stop at the scenic beach of Lang Co for a drink before proceeding to Hue. This afternoon we embark on a tour of Hue City including the Citadel and the Forbidden Purple City, the Imperial Museum and Dong Ba market. After breakfast in the hotel, you are free until transfer to airport for flight to Hanoi. On arrival, our guide and driver will pick you from the airport to hotel in town for check in and refreshment. The rest of the day, we will have a brief city tour: discover Hanoi Old Quarter on cyclo ride, enjoy Water Puppet Show at Thang Long Theatre - the unique form of Vietnamese art derived from wet-rice civilization in South East Asia. 08:00: Get picked up for a 3,5 hour drive to Halong passing the country side of Red River Delta. Spend 24 hours on a traditional Junk Cruise in the amazing bay: a natural wonderland composed of jutting limestone islands and sparkling turquoise waters. Arrive at the dock around noon and board your cruise. Savor a gourmet lunch of fresh seafood onboard as we sail out into the mystical bay. In the afternoon, cruise around some of Halong’s many islands, including Dinh Huong and Ga Choi. Along the way visit one of the bay’s 3 largest caves (Thien Cung, Dau Go or Sung Sot). Stop at an island cove with a sheltered white-sand beach and take a dip in the warm waters of the East Sea (Bien Dong) (weather permitting). Pass the night on your cruise, lulled to sleep by the gentle rocking of calm waters. Return to the junk for breakfast then take advantage of the sundeck and admire the amazing rock formations of Bai Tu Long Bay as you navigate back to Halong City. Have lunch on board the boat before returning to Halong pier. Your driver will meet you at the dock and take you back to Hanoi. Today you have a full day to explore Vietnam’s charming capital. With its wide tree-lined boulevards, French colonial architecture, peaceful lakes and ancient oriental pagodas; Hanoi is an eclectic mix that offers something for everyone. 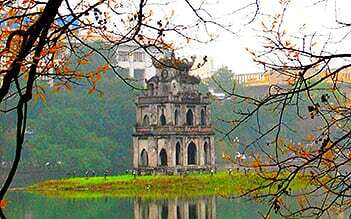 Your city tour will take you to Hanoi’s key sites: the Ho Chi Minh Complex (Ho Chi Minh's Mausoleum and stilt house); the Presidential Palace; the nearby One Pillar Pagoda; the Old Quarter; the Temple of Literature; West Lake; the sedate Tran Quoc Pagoda & Quan Thanh Temple. Take the late afternoon flight to Yangon. Up on arrival to Yangon International airport, your driver will welcome you and transfer you to hotel in central of Yangon City. Take the morning flight to Mandalay, Our tour guide and driver will welcome you and take you on a full day tour in Mandalay. We first drive to Sagaing Hill, discover the monk education, visit Budda cave, Uminthonze pagoda and Sunooponnyashin pagoda. Behold the panoramic view of Mandalay. The next stop is Amarapura - being famous for Mahagandaryone Monastery Amarapura is the best place to experience the monk life in Mandalay. Walk over Ubein Bridge - the longest teakwood of its type to Mahamuni Image - a bronze Buddha image castled during the lifetime of Buddha himself. Drive to Mandalay pier, embarking on a boat upstream to visit Mingun, famed for its huge and incomplete Pahtodawgyi Pagoda and Mingun Bell the 90 tons ringing bell. In the afternoon, visit Mandalay Palace, Shwenandaw Monastery - noted for its exquisite wood carvings, gold leaf beating workshop, Kuthodaw Pagoda - known as the world biggest book. 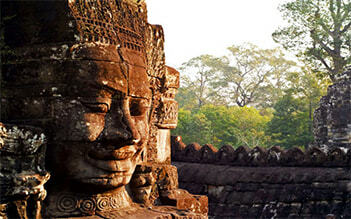 Take the afternoon flight to Bagan. On arrival, your driver will transfer you to hotel. After breakfast, start with the exotic horse cart to one of the biggest temple in Bagan: Nan Paya pagoda and many other interesting sites nearby, continue with sightseeing to Minkaba Gubyaukyi Temple, experience the architectural difference in MyaZedi pagoda before heading to Manuha Temple. The highlight of today is the panoramic sunset view from the second highest pagoda of Bagan the ShweSandaw pagoda. Continue our sightseeing today by a visit to Minkaba Gubyaukyi temple, experience the architectural difference in MyaZedi pagoda before heading to Manuha Temple. This afternoon, enjoy the exotic horse cart to one of the biggest temple in Bagan: Nan Paya pagoda and many other interesting sites nearby. Later in the afternoon, take flight to Yangon. On arrival, our driver will welcome you and transfer you to hotel in town. We then embark on an orientation walk from Sule Pagoda to Chinese Town, covering exotic streets of Yangon downtown and British Colonial building as Emmanuel Church, Inland Water Buildings. Kyaukhtatgyi Pagoda’s 70m long reclining Buddha and Myanmar’s holiest monument. Rest of the day is free for your shopping at Bogyoke Market until get transferred to your departure flight. We were recommended to use this company to organise all our activities and transport in Ho Chi Minh, and even from our initial contact it was obvious that they pride themselves on superior customer service. All our transfers were well organised and we were met and welcomed. They were always early. We organised some day trips as well, and they were able to package them all into one cost. The day trips were excellent, with a great guide and great drivers. We did a Foodie tour on foot which was amazing and each restaurant was obviously well patronised by HCM locals. The food was interesting and different, including snails. All our other tours were of high quality and the guide was very knowledgeable and took great care to ensure our safety and our enjoyment. I would highly recommend them. This is probably the best trip I have ever taken. We went to Hanoi and Ha Long Bay in Vietnam and Inle Lake, Bagan and Yangon in Myanmar. The sights were fascinating and the history was incredible, especially seeing so many pagodas in Bagan, Myanmar and hearing the stories about a number of them by the guide. In addition, we had the opportunity to visit local markets and villages in Myanmar where we could see how the local people lived and the produce/products sold. The restaurants they took us to had food that was incredible and far different than in the US. In both countries, the tour guides were knowledgeable and could answer most if not all questions. Izbooking also handled all logistics at each airport and all transportation which made the trip go very smoothly. I would recommend this agency for anyone visiting Southeast Asia.